Leah Hogsten | The Salt Lake Tribune Brooke Smart draws and watercolors illustrations in her home studio, Thursday, October 4, 2018. Smart is an illustrator hired to create a portrait collection for Better Days 2020. The organization is working to educate people about women who played important roles in Utah history. Smart's series will feature 50 women and men who played formative roles in Utah history. 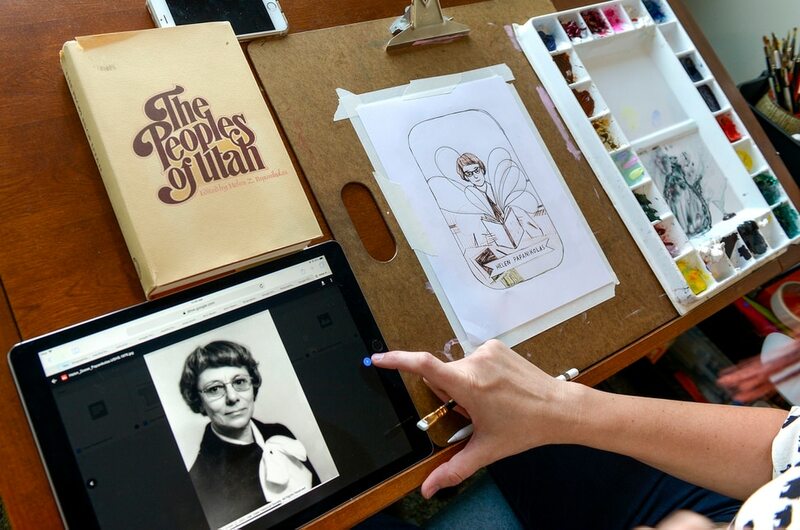 Leah Hogsten | The Salt Lake Tribune Brooke Smart draws the likeness of Helen Z. Papanikolas, a Greek-American historian, novelist and folklorist who documented the immigrant experience in Utah and the American West from a photograph in Smart's home studio, Thursday, October 4, 2018. Smart is an illustrator hired to create a portrait collection for Better Days 2020. The organization is working to educate people about women who played important roles in Utah history. Smart's series will feature 50 women and men who played formative roles in Utah history. 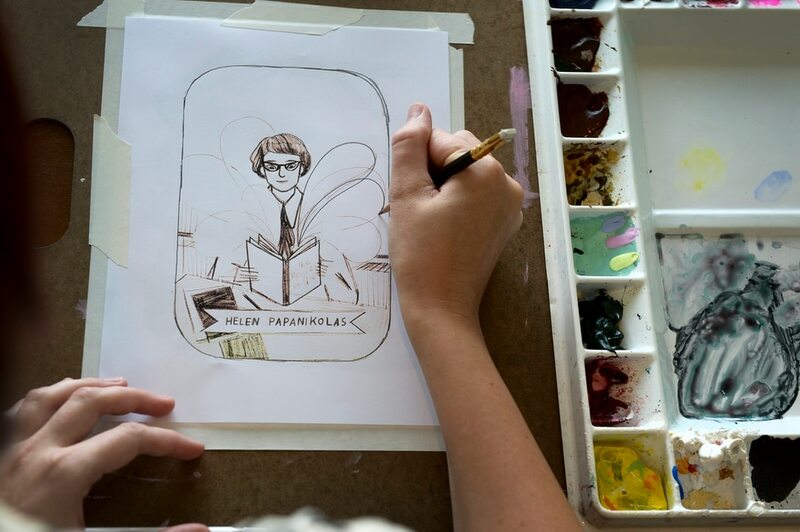 Leah Hogsten | The Salt Lake Tribune Brooke Smart draws the likeness of Helen Z. Papanikolas, a Greek-American historian, novelist and folklorist who documented the immigrant experience in Utah and the American West from a photograph in Smart's home studio, Thursday, October 4, 2018. Smart is an illustrator hired to create a portrait collection for Better Days 2020. The organization is working to educate people about women who played important roles in Utah history. Smart's series will feature 50 women and men who played formative roles in Utah history. Leah Hogsten | The Salt Lake Tribune Brooke Smart draws the likeness of Helen Z. Papanikolas, a Greek-American historian, novelist and folklorist who documented the immigrant experience in Utah and the American West from a photograph in Smart's home studio, Thursday, October 4, 2018. Smart is an illustrator hired to create a portrait collection for Better Days 2020. The organization is working to educate people about women who played important roles in Utah history. Smart's series will feature 50 women and men who played formative roles in Utah history. (Courtesy of Brooke Smart) Artist Brooke Smart painted historian Helen Papanikolas for the Better Days 2020 campaign, which highlights Utah women in history to encourage the state’s women today to become involved in politics, business and other community leadership roles. Leah Hogsten | The Salt Lake Tribune Brooke Smart's tools of her illustration and watercolor trade in her home studio, Thurday, October 4, 2018. Smart is an illustrator hired to create a portrait collection for Better Days 2020. The organization is working to educate people about women who played important roles in Utah history. Smart's series will feature 50 women and men who played formative roles in Utah history. (Courtesy of Brooke Smart) Artist Brooke Smart painted Native American advocate and writer Zitkala-Sa for the Better Days 2020 campaign, which highlights Utah women in history to encourage the state’s women today to become involved in politics, business and other community leadership roles. (Courtesy of Brooke Smart) Artist Brooke Smart painted Utah suffragist. journalist and Latter-day Saint Relief Society president Emmeline B. Wells for the Better Days 2020 campaign. It highlights Utah women in history to encourage the state’s women today to become involved in politics, business and other community leadership roles. (Courtesy of Brooke Smart) Artist Brooke Smart painted education leader Mignon Barker Richmond for the Better Days 2020 campaign, which highlights Utah women in history to encourage the state’s women today to become involved in politics, business and other community leadership roles. (Courtesy of Brooke Smart) Artist Brooke Smart painted civil rights leader Alice Kasai for the Better Days 2020 campaign, which highlights Utah women in history to encourage the state’s women today to become involved in politics, business and other community leadership roles. (Courtesy of Brooke Smart) As artist Brooke Smart was shifting from oil painting to watercolor painting and developing her career in illustration, she assigned herself a 100-day series of paintings showing her life with her young daughter, Remy. This illustration is titled Nakey Bird On The Run. (Courtesy of Brooke Smart) As artist Brooke Smart was shifting from oil painting to watercolor painting and developing her career in illustration, she assigned herself a 100-day series of paintings showing her life with her young daughter, Remy. This illustration is titled Sunshine. (Courtesy of Brooke Smart) As artist Brooke Smart was shifting from oil painting to watercolor painting and developing her career in illustration, she assigned herself a 100-day series of paintings showing her life with her young daughter, Remy. This illustration is titled Yogis. (Courtesy of Brooke Smart) As artist Brooke Smart was shifting from oil painting to watercolor painting and developing her career in illustration, she assigned herself a 100-day series of paintings showing her life with her young daughter, Remy. This illustration is titled Sweet Reunion. (Courtesy of Brooke Smart) As artist Brooke Smart was shifting from oil painting to watercolor painting and developing her career in illustration, she assigned herself a 100-day series of paintings showing her life with her young daughter, Remy. This illustration is titled Hula Hoops. (Courtesy of Brooke Smart) As artist Brooke Smart was shifting from oil painting to watercolor painting and developing her career in illustration she assigned herself a 100-day series of paintings showing her life with her young daughter, Remy. This illustration is tltled Disneyland. (Courtesy of Brooke Smart) As artist Brooke Smart was shifting from oil painting to watercolor painting and developing her career in illustration, she assigned herself a 100-day series of paintings showing her life with her young daughter, Remy. This illustration is titled Picture Books. A Dakota woman in traditional dress sits in front of Mount Timpanogos holding a violin. In front of her are pages of the 1913 opera she wrote in Utah, celebrating the sun dance. A red bird flies behind her, representing the meaning of her name — Zitkala-Sa. Smart has been commissioned by Better Days 2020 to paint 50 people, most of them women, who played formative roles in Utah history. The nonprofit wants to raise awareness of women who were community leaders in the past, hoping to encourage today’s women to become more engaged in business and politics. Women in Utah Territory gained the right to vote in 1870, right behind women in Wyoming Territory, and voted first because Utah had an election sooner. Better Days 2020 refers to the 150th anniversary of those first votes by Utah women, and its campaign celebrates Utah’s later election of Martha Hughes Cannon, the first female state senator in the nation. But today, Utah routinely ranks at or near the bottom of national equality rankings, based on data about its low representation of women in government and as business leaders, its gaps in higher education and pay for women, and other factors. Most of the people Smart is painting contributed to Utah’s suffrage movement, which was reignited after the 1887 Edmunds-Tucker Act outlawed polygamy and disenfranchised the state’s women. They regained the vote with statehood in 1896. The style that helped Smart land the commission — such as including features that represent the subject’s passions, hobbies and life events — is one she developed when her own life took an unexpected turn. Although Smart got a degree at Brigham Young University in illustration, she loved to work with oils and paint realistic images. That became more challenging six years ago, when her marriage was ending just as her daughter, Remy, was born. Oil painting required large blocks of time during daylight hours, difficult to arrange for a single mom with a young child. Oil paints were toxic and took a long time to dry. Sometimes Remy would play in the drying work or try to eat the paint. She decided to switch to watercolors, which dry quickly and are nontoxic. Watercolor painting was also easier to do at night because it did not require natural light. She experimented with commissioned portraits that became the style predecessors for the Better Days project. And when Smart didn’t have a project from a client, she would assign herself something to work on — including a 100-day series about her relationship with her daughter. Each day she painted herself and Remy doing things like playing pretend, making a meal or getting ready for bed. It took a few years for Smart to begin getting steady illustrating work and even longer for her to get the kinds of assignments she really wanted to do. She might design a logo for a new business, for example, only to be frustrated when owners waffled about what they wanted. Smart’s determination began to pay off in about 2015. Rather than having to pitch her work to publications she was interested in, people began approaching her with projects they wanted her to do. She painted a child covered in bandages to illustrate a New York Times op-ed by Sheryl Sandberg about raising resilient children. 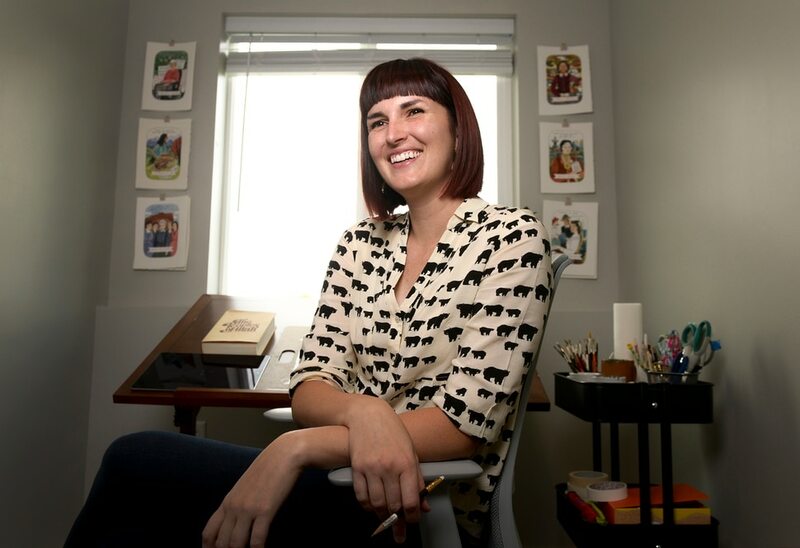 She created artwork for stories in magazines published by The Church of Jesus Christ of Latter-day Saints, including a painting of a girl with long pigtails writing while lying on a colorful blanket that accompanied an article about journaling. She painted images depicting the life of Jane Goodall for Bravery magazine, a publication for kids that celebrates strong women. Last fall, Smart was invited to interview for the illustrator position at Better Days. The project interested her so much that before she was selected, she visited the Pioneer Memorial Museum in Salt Lake City and begin studying the life of Emmeline B. Wells, a Utah suffragist who met four U.S. presidents and served as a Latter-day Saint Relief Society president. Some of the individuals highlighted by the project, like Wells, kept journals or are written about in easily accessible historical accounts. Others are only mentioned in passing. Smart, now 33, said she tries to be conscious of every element of an image. Wells was the first portrait Smart painted for the project. In the illustration, Wells stands at the top of Ensign Peak and looks out over Salt Lake City. She is surrounded by wheat. In her arms are copies of the Woman’s Exponent, a newspaper she wrote for and edited for many years. She is wearing her favorite amethyst earrings and a gold ring gifted to her by Susan B. Anthony. Another one of Smart’s images features Mignon Barker Richmond, the first African-American woman in Utah to earn a bachelor’s degree. Smart painted Richmond in front of a state map highlighting places she studied and served. Richmond holds the diploma she earned at Utah State University and a book written by her friend Langston Hughes. Smart included a young girl holding a lunch tray to represent Richmond’s love of children and her leadership in starting Utah’s first school lunch program. Based on Smart’s first 20 portraits, Better Days 2020 has printed cards for teachers; each version includes an illustration and a short biography of the subject. Ben Fries, a Bennion Junior High teacher who received prints to use in his classroom, said he has noticed students respond especially well to images. That connection is something Smart has felt as she’s worked on the illustrations. She wishes she could have conversations with the women she’s painted.